To protect budgets for research grants from being further squeezed by rising facilities operations costs, the National Science Foundation plans to propose shoring up support for research disciplines such as astronomy and ocean sciences, where the problem is particularly pressing. At a meeting of the National Science Foundation’s Mathematical and Physical Sciences (MPS) Advisory Committee this month, NSF Director France Córdova said the agency plans to propose bolstering the budgets of the divisions that are most heavily burdened by rising facility operations and maintenance (O&M) costs. While Córdova said she could not yet share the details of the proposal, she cited the Astronomical Sciences Division, the Ocean Sciences Division, and the Biological Sciences Directorate as having a particularly acute need for assistance. 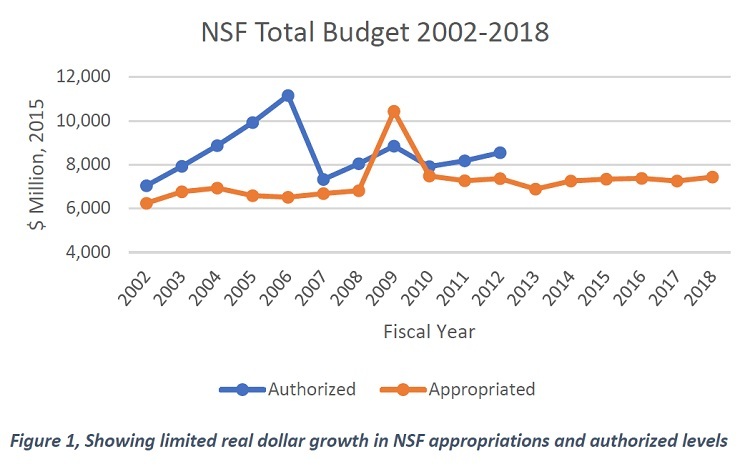 The issue of rising O&M costs squeezing budgets for research grants has come to a head in recent years as several large NSF research facilities have entered or neared operations during a decade where the NSF budget has been mostly flat. Congress tasked the National Science Board with studying the matter, and the resulting report recommends the agency make structural changes to how it manages and funds facilities. NSF has not yet formally responded to the report. 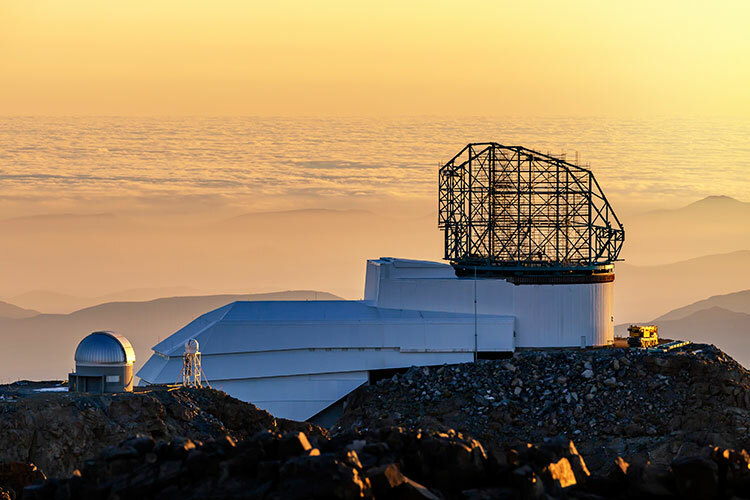 When completed, the Large Synoptic Survey Telescope in Chile will collect nearly 40 terabytes of data every night to produce a comprehensive map of the sky. The telescope is currently in the sixth year of a nine-year construction phase. NSF's annual contribution to facility O&M costs is projected ramp up to nearly $30 million per year by fiscal year 2024. During the meeting, Anne Kinney, the head of the MPS directorate, detailed how facility O&M spending varies considerably across the directorate’s five divisions. In fiscal year 2017, the Astronomical Sciences Division spent 62 percent of its budget on facilities, while the Physics Division devoted 35 percent. 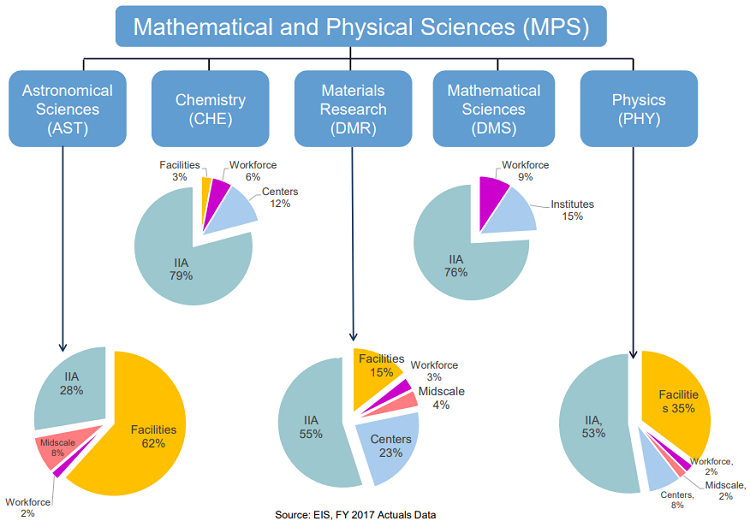 At the other end of the spectrum, the Chemistry Division spent 3 percent and Mathematical Sciences Division spent nothing. The Materials Research division was in the middle at 15 percent. If that burden from LSST goes entirely into the Astronomical Sciences Division, the division will go belly up and have no more funds for individual awards, at which point you can’t take advantage of LSST because you’ve got nobody funded to do research on it. Presently, NSF funds large facility construction costs through an agency-wide account called Major Research Equipment and Facilities Construction (MREFC). Once a facility is completed, individual research divisions or directorates must bear the O&M costs for its lifetime. Anne Kinney used this slide in her presentation to contrast the spending breakdowns of the five divisions in MPS. IIA = Individual Investigator Awards. Click to enlarge. However, Córdova also emphasized that the ability of NSF to expand its facilities footprint hinges on more than a new means of managing O&M costs. “Ultimately, the willingness to engage in further big projects … is going to depend on the overall budget and convincing the authorizers and appropriators that what we’re delivering is a spectacular benefit to the American people,” she remarked. Córdova pointed to pending House and Senate spending bills for fiscal year 2019 that include increases for NSF as a promising sign of support for the agency. She also said the NSF’s first-ever chief officer for research facilities, Jim Ulvestad, has helped her gain a much better understanding of facilities pain points across the agency. Kinney indicated that the facility O&M proposal could have implications for other pressing budgetary decisions facing the agency. “If indeed there is some budget relief due to a different treatment of O&M,” Kinney said, MPS would likely have the advisory committee help assess the tradeoffs of focusing newly available resources on increasing the size of individual investigator grants versus the number of grants awarded. “It really worries me that the dollar amounts have not increased, and of course it also worries me that the funding rate is hovering at 20 percent,” Kinney said. Lamenting that NSF has to turn down so many meritorious grant proposals, she added, "I fully believe that if you look at the scientific capacity of the country, you could double the budget tomorrow and you would absolutely get 100 percent of the return on your dollar." In the final appropriations agreement for fiscal year 2017, Congress directed the National Science Board to assess NSF’s facility planning procedures and weigh in on whether NSF should establish an account dedicated to funding facility O&M. The board’s report concludes it is unnecessary to establish such an account at this time but suggests NSF could broaden the scope of the MREFC account. The board suggests such an account could enable divisions to gradually incorporate new facility O&M into their budgets. It could also fund facility dismantlement costs that would be prohibitively expensive for a single division to bear as well as keep facilities running in cases where “compelling national or agency strategic imperatives” override the priorities of a particular research community. Furthermore, since NSF is not required to spend MREFC money in the year it is appropriated, the account could help the agency participate in international partnerships where multi-year resource commitments are necessary. The report identifies the rapid growth in grant proposals submitted to NSF as the primary driver of decreasing award rates. Between 2002 and 2017, the number of proposals increased by over 40 percent and the overall award rate decreased from 29 percent to 23 percent. However, the report explains that facility O&M cost growth has weighed heavily on some divisions. The report offers case studies of how the Astronomical and Ocean Sciences Divisions have grappled with the issue. Some of their problems were “foreseeable,” the board writes, as NSF used almost 60 percent of MREFC money allocated from 2002 to 2017 to build six facilities across the two divisions. The board stresses it does not mean to “second-guess past strategic decisions.” Rather, it seeks to “emphasize limitations to a division-centric strategy and planning model.” It also highlights the disparity between the large budget increases Congress authorized for NSF from 2002 to 2012 and the amounts ultimately appropriated. The board notes the 2010 astronomy and astrophysics decadal survey made recommendations based on the budget doubling over the decade, as envisioned by authors of the America COMPETES Act of 2007. A separate case study describes how the Ocean Sciences Division decided to scale back the Ocean Observatories Initiative (OOI) shortly after it was completed to keep O&M costs under control. This was one of several “course corrections” recommended by the 2015 decadal survey for ocean sciences.